Deacon Judson Wallace, 89 of Kimberly, WV went home to be the Lord on March 29, 2019. He was the son of the late Watson Wallace, Sr. and Marie Byrd Wallace. In addition to his parents, he was preceded in death by his wife Bertha Wallace, son Dennis K. Wallace, brothers Charlie Wallace, William Wallace, Augustine Wallace, Watson Wallace, Jr., Delmar Wallace, Emory Wallace, Sr., Fredrick Wallace, Johnny Wallace, sisters Juanita Wallace, and Lonzetta Massey. 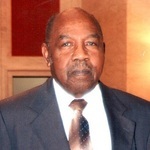 Judson was a member of Eagle Central Baptist Church, where he was a Deacon, Trustee, and Sunday School Teacher. He was the President of the WV Baptist Quartet Convention and he sung with the United Baptist Singers for 56 years. He was the owner and operator of Wallace Market in Mt. Carbon, WV for 26 years; retired Deputy Sherriff of Fayette County, after 10 years of service, former coal miner, Commissioner of the Armstrong Deepwater Public Service District, former Construction Worker-Local Union #1353, former Chief Assistant to Sergeant at Arms at the WV State Senate, President of the former Upper Kanawha Valley Community Center, active member of the Christmas Cheer committee, and 2003 Fayette County Democrat of the year. Judson is survived by his daughter Charlotte “Linda” Wallace, of Kimberly, WV; brother Elder Joseph Wallace (Jean), of Buffalo, NY; Donald White, who he loved like a brother, and sister- in- law Shirley White, both of Kimberly, WV. Sister-in-laws Delores Wallace, of Harlem Heights, WV, Queen Wallace, of North Carolina, and Rebecca Wallace, of Summerlee, WV. Along with a host of nieces, nephews, other family members and friends. A homegoing service will be held on Saturday, April 6, 2019, at Brookside Ministries, Mt. Carbon, WV with Elder Joseph Wallace officiating. Service will begin at 1:00 pm, viewing one hour prior to the service. Burial will follow at Meadow Haven Memorial Park, Ingram Branch. Special Thanks to Brandy and Hospice workers Sonja, Edie, and Thea.